Layoffs on Wall Street slipped in January to the lowest level seen since June 2017. However, the real story in the January jobs data was new hiring plans, which surged to the highest monthly level seen in more than eight years. This data could suggest that the Wall Street jobs outlook could finally be on the upswing. According to the January Challenger, Gray & Christmas monthly Job Cuts Report released last week, the financial services industry saw planned layoffs slip 4% to 637 layoffs from 664 layoffs announced in December. The January layoff figure represents an 145% surge from the 260 layoffs reported during January of 2017. The January layoff total marks the lowest monthly level of staff reductions seen since June of last year. New hiring plans in January was surprisingly robust as financial services firms announced that 6,500 new jobs were available, significantly higher than the 473 new jobs announced in December. The January hiring plans figure marks the highest monthly level of new jobs available collected in at least the past eight years. 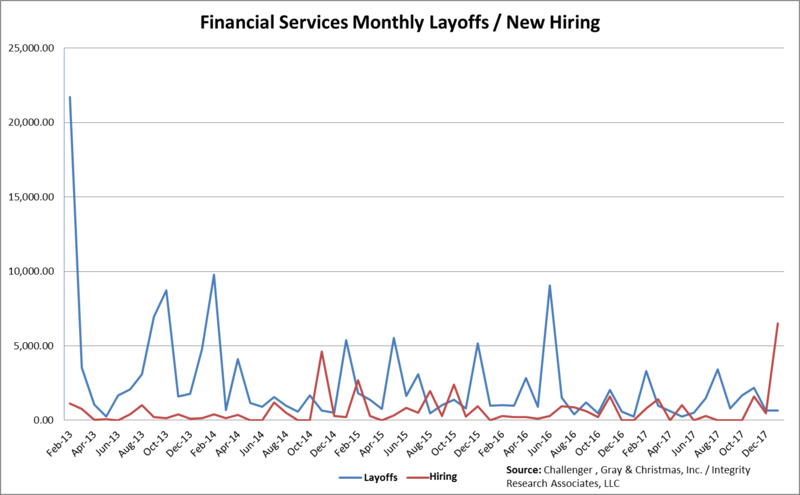 As you can see from the above chart, layoffs on Wall Street have consistently outstripped new hiring plans, suggesting that net employment in the financial services industry has been contracting for a number of years. However, occasionally new hiring plans have exceeded layoffs, as was the case in January. In fact, over the past twelve months, monthly hiring plans have eclipsed layoffs three times – in March, May and then in January. This pattern suggests that bank executives might finally believe that their staffing levels have been “right sized”, and they are preparing to expand their payrolls. The January Challenger Gray & Christmas monthly job cut report is clearly a constructive sign for the Wall Street jobs outlook as both layoffs dropped and new hiring plans surged. While we admit that the recent tax overhaul and Fed rate hike should prove beneficial for investment bank earnings in the coming quarters, we are concerned that weak trading commission volume and regulatory pressures could counter these factors. Consequently, we would not be surprised if Wall Street management remained cautious about their hiring plans in the coming months. As far as the investment research business is concerned, we suspect most investment banks and independent research firms will hire around the edges. Some firms may try to add experienced analytical staff in order to encourage their buy-side clients to pay them more for their research. However, we doubt that many banks or independent research firms will aggressively try to grow their headcount of analysts or salespeople – at least until they get more clarity about how MiFID II is impacting their trading commission revenue and their research payments.